A firm favourite in these parts, Dovedale is a blue veined, full fat soft cheese – a mild, creamy, gooey blue. 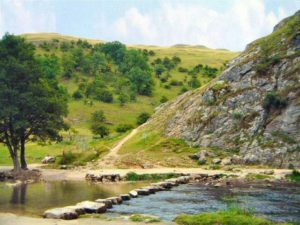 Dovedale is one few British Protected Designation of Origin cheeses (not having a PDO is the reason why not all Cheshire cheese is made in Cheshire, for example). Previously made in Hartington, it is now made by the Staffordshire Cheese Co in Cheddleton, with milk from Derbyshire, Nottinghamshire and Staffordshire. It is also one of few cheeses to be dipped in brine during maturation, a process more common to Middle Eastern and Mediterranean cheeses like Feta. Taking inspiration from that part of the world, how about pairing it with figs? Try halving fresh figs and roasting with a dollop of Dovedale on top, with or without a wrapping of thin sliced cured ham like prosciutto, and a drizzle of honey and/or balsamic vinegar. The prosciutto should crisp up nicely and turn it into a finger-friendly canapé. Otherwise serve on toasted baguette, or – if that’s still too gooey for you – as part of a salad.